Home › Electronics › Lifetime Warranty + Free Screen Protector Eco-Friendly Tribe Sports Running A.. Lifetime Warranty + Free Screen Protector Eco-Friendly Tribe Sports Running A..
FREE IPHONE 6 Plus (5.5") SCREEN PROTECTOR WITH EVERY ORDER! 100% MONEY BACK GUARANTEE: If For Whatever Reason You Don't Absolutely Love Your Tribe Armband, Just Return It And We Will Refund Every Penny Or Replace It, No Questions Asked. ENVIRONMENTALLY FRIENDLY: The Tribe Non-Slip iPhone 6 Plus (5.5") Armband is SGS Approved. Join the Green Side! Eco Friendly. SIZING & COMPATIBILITY: Tribe's Double Adjustable Velcro Armband Will Fit Almost Any Arm Size Up To 16". Our Armband Can Support Usage Of The iPhone 6 Plus (5.5"), As Well As Any Phone That Has A Screen Up To 5.2". BONUS FEATURES: Our Armband Includes A Reflective Strip For Safe Running In Low Light Conditions. Secure Built-in Hidden Key Holder Perfect For House/Car Keys! Never Worry About Having To Carry Your Keys In Your Pocket Or Losing Them At The Gym. 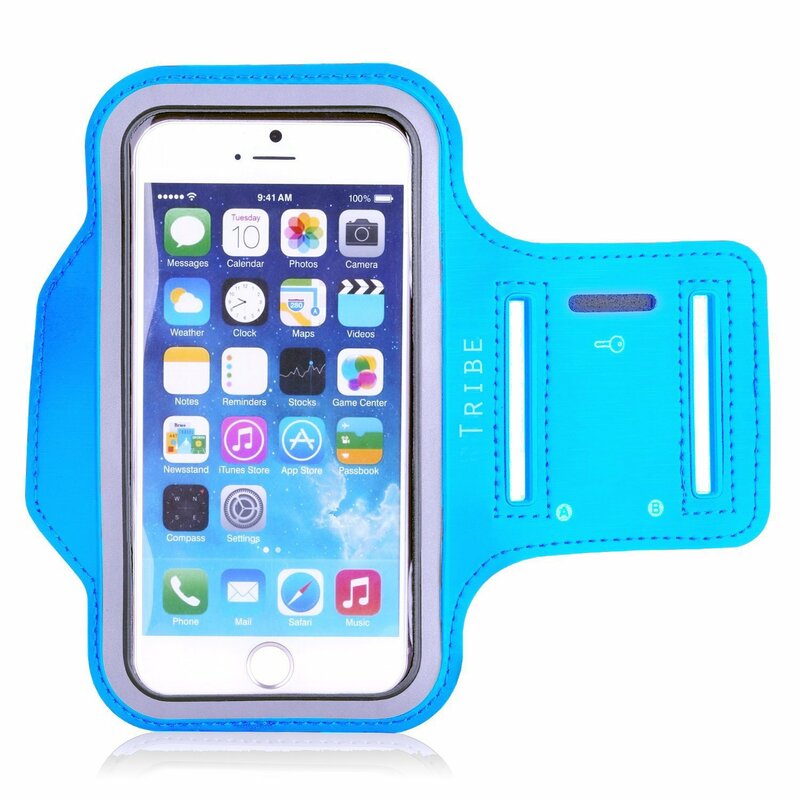 Color: iPhone 6 Plus Light Blue iPhone 6 Plus Sports Armband by Tribe, If you've ever been out running andtried to listen to music or send a quick text while taking a breather you knowits almost impossible to use your phone without covering it with sweat orworse dropping it along the way! Now with this armband you can safely interactwith your touch screen and listen to your favorite music :) Compatibility and Use Use your armband with the new iPhone 6, 5s, 5, 5c. Youcan wear it over your biceps or on your forearm. The night reflector providesadditional visibility for outdoor early morning and evening runs. There iseven a slot for your house key which we all know can be a lifesaver. Thisarmband is also great for high intensity workouts, yoga or even casual walkingor outdoor activities. Precision and Protection The touchscreen is fully accessible through theplastic cover. The armband pouch and cover keeps your phone safe from impactand moisture while working out. Size This armband is lightweight and accommodates arm sizes from approx. 8 to15.5 inches. Also we recommend that you use this armband without a case. Material and Care Made of all Eco-Friendly materials, ie. nylon, velcro andneoprene materials. This armband can be safely hand washed and air dried afteruse. We do NOT recommend machine washing your armband as this could causedamage. Why pay more? Protect your $600+ device with quality and style! This armbandis a super deal at an extremely low price. It also makes a great gift idea!Get yours today!